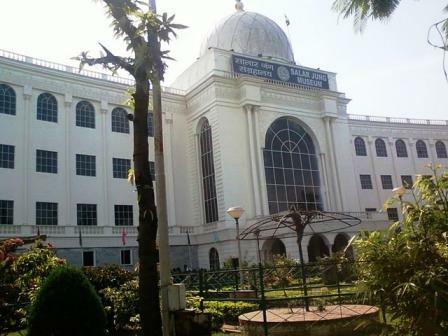 Salarjung Museum is the famous art museum of Hyderabad, located on the southern bank of the River Musi. It is the 3rd largest museum in India, and is the effort of one man's priced collection. The museum was originally started as the private collection of Mr. Yousuf Ali Khan Salar Jung III (1889-1949), later was converted to a Museum for public. He was the Prime Minister of the 7th Nizam of Hyderabad. His collections include arts belonging to different civilizations dating back to the 1st century. There are about 38 galleries housed here. Indian galleries are located in the first and ground floors of the main building. The eastern galleries are housed in the first floor of the Eastern block and the western galleries are housed in the ground floor and first floor of the Eastern block. Some of the notable collections are the sculpture of veiled Rebeca, an Italian sculptor's work Double Figure, amazing bronze collections of South India, jade crafted knifes of Jehangir and Nurjehan, stunning ivory collections, and many famous European paintings. If you want to see everything in the galleries and learn about them, you will need quite a lot of time. If you go in the tourist group time may not be sufficient. Apart from the art collections, the Salarjung Museum is also famous for the 19th Century mechanical clock. Every hour, a little man comes out and bangs a bell then disappears back into the clock, and another figure who is a blacksmith, is constantly tapping away at something.. Every hour the large auditorium is packed with visitors to watch this on the television screens on the wall. It is quite an interesting thing to see. So try to find time to be there during that time. Photography is not allowed inside Salarjung Museum, Hyderabad. Timings of the Museum: 10.00a.m. to 5.00p.m., Open daily except Fridays. It is one of the must visit places in Hyderabad for any tourist. What makes this Salar Jung Museum all the more special is its location. It is located quite close to the other tourist spots of Hyderabad such as Charminar, Mecca Masjid, High Court, State Central Library, etc. If you really want to enjoy seeing all the things there you will need at least a whole day. Return from Salarjung Museum to Hyderabad.